If Cisco thought it was unloading a consumer brand that no longer fit with its enterprise focus by selling its Linksys business unit to Belkin, Cisco’s in for a surprise: Belkin is embarking on an ambitious campaign to once again make Linksys a major player in the SMB networking market. Indeed, Linksys had significant shares of both the consumer and SMB markets when Cisco acquired it in 2003. But Cisco rebadged Linksys’s business-oriented hardware as Cisco products and used the Linksys brand solely for consumer devices. A source inside Linksys, however, tells me that many of the Linksys business-unit engineers remained and came over to Belkin as part of the acquisition. 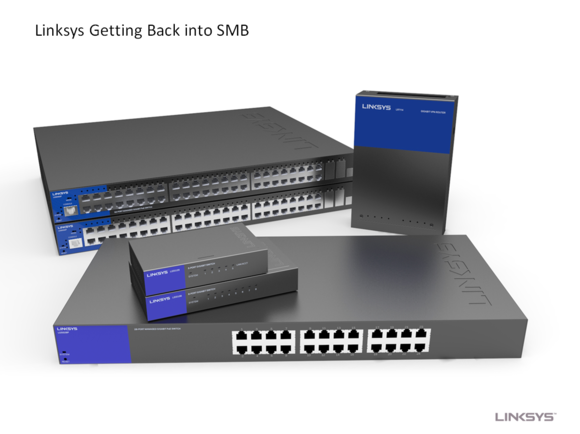 Belkin initial SMB offerings will include Linksys-branded gigabit unmanaged ethernet switches, ranging from 5 to 24 ports in size. Belkin, meanwhile, is best known as a consumer-electronics manufacturer, selling cables, smartphone and tablet cases, outlet strips, webcams, and simple home-automation devices. But dig a little deeper and you’ll find that Belkin has a robust line of business-oriented products, too, ranging from KVM (keyboard, video, mouse) hardware for controlling rack-mounted servers to the hulking racks those servers are mounted into. 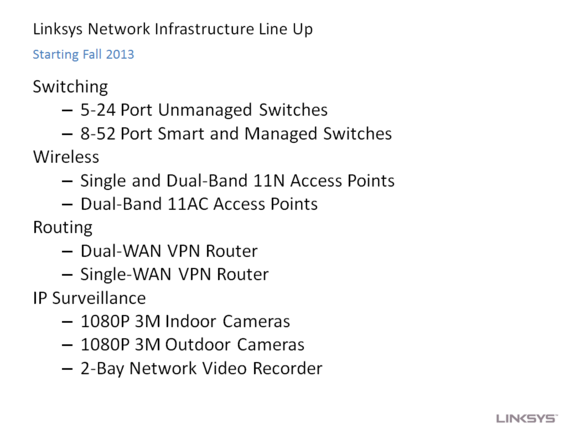 Belkin's IT infrastructure offerings go a lot deeper than you might think. Belkin’s first Linksys-branded products after the acquisition were aimed at consumers, but starting in November and continuing into 2014, the privately held company will launch a host of new Linksys products into the SMB market. The first wave, which Belkin will announce in November, will include a line of unmanaged gigabit switches with between 5 and 24 ports. Dual- and single-WAN VPN routers are the next item on the roadmap, and these will be followed by single- and dual-band 802.11n wireless access points, and dual-band 802.11ac wireless access points. The Network Magic software that Linksys acquired from Pure Networks a number of years ago will also apparently be returning to the limelight. In January, Belkin intends to ship Linksys-branded indoor and outdoor IP surveillance cameras, along with a two-bay network video recorder. In the March/April timeframe, Belkin plans to announce a line of managed gigabit switches in configurations ranging from 8 to 52 ports, as well as some PoE (power-over-ethernet) switches. 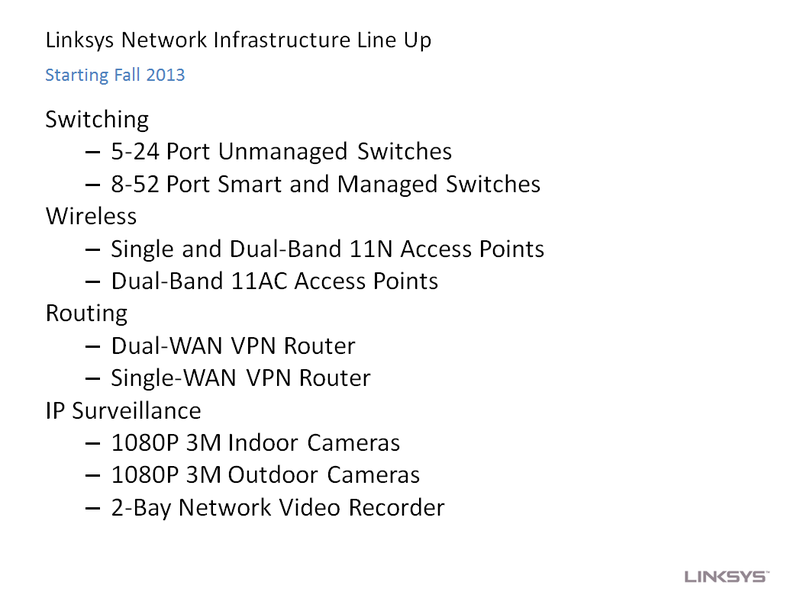 Belkin is planning an ambitious roadmap for its Linksys brand. Later in 2014, Belkin will introduce cloud-management solutions (although the company revealed few details as to what that will entail). This will be followed by an office-automation initiative that will include Belkin’s existing WeMo product line for power management and lighting controls with some new products the Linksys team is working on. The Linksys divestiture ended Cisco’s involvement in the consumer market, so one has to wonder if the company’s management imagined they’d end up competing with their former business unit in the business market. This should be fun to watch.